"Join The ClickFunnels Affiliate Program And Let Us Buy Your DREAM CAR For You!" 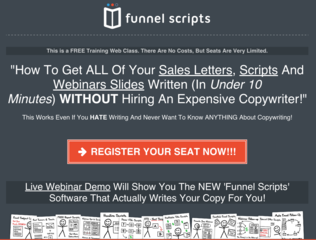 Get Started With The ClickFunnels Affiliate Program NOW! YES! I Want To Become One Of Your Overpaid Super Affiliates NOW! And We'll Cover The Payments On YOUR Dream Car!" We Want To GIVE You THAT Car... For FREE! As a member of the Click Funnels affiliate program, you are automatically enrolled into our "Dream Car" contest. Each month, as you signup new members, you will get closer and closer to getting your DREAM CAR! Step #2 – We Send You $500 Per Month Towards Your Lease Payment – As long as you stay above 100 active Click Funnels members, we’ll send you a $500 check to reimburse your payment on your dream car!Ferrari? Step #3 – We’ll Increase It To $1,000 Per Month When You Get To 200 Members! - In any month that you have at least 200 active Click Funnels members, we’ll send you $1000 check to reimburse your payments on your dream car! Will One Of Them Be Yours? And Earn Commissions On All Of Our Best Selling Products! You also have the ability to earn huge recurring commissions on all of our top level products and services! Follow Your Visitors Across All Of Their Devices - If someone registers for a webinar at the office, or on their phone, but then watches the webinar at home... don't worry! Sticky cookies has you covered and will make sure you still get paid! Focus On Front End Products – You can focus on selling ANY of our products (even the free + shipping front end products) and if/when they purchase any of our other products in the future, sticky cookies will make sure you get paid! Each month we're coming out with cool new front end products that will make sure YOU keep getting paid everyday from the work you're doing today! Shouldn't Some Of It Be Yours? Imagine What It'll Be Like When We Award You YOUR Dream Car! Video Of Todd Brown Getting The FIRST Dream Car To Kickoff Our Contest! Congrats Todd! The Next Car Could Be Yours!!! Don't worry, you can still promote just create an affiliate account and come back here to login.. Step #3 - Let us know how we can help you win YOUR dream car!! !